Novelist Eric Arvin’s latest literary offering is nothing short of a masterpiece. In a story that weaves together the worlds of fantasy, paranormal activity, and romance, the result is not only a highly entertaining read but also a tale that will resonate with the reader. The Mingled Destinies of Crocodiles and Men is set in a time where mystics such as Minerva True occupy an exalted place in society. It is Minerva, who is a “river dweller,” that recognizes the danger situated in ancient lore that threatens her world on a hilltop which once hosted a chapel. Few people heed her prophetic warnings and soon there is only a small group who stand with her. Leith, the handsome hero, and his lover Aubrey are locked into the coming struggle which Minerva has prophesied. There is also a mute boy called Deverell who is destined to play an integral part in the drama which will overwhelm them. And Calpurnia, Leith’s half crazed mother, is drawn into the plot mostly by her own ambitious agenda. For Calpurnia’s mission is a threat not to only to Minerva’s plight but to everyone who will play a part in the climax of this inspired fable. 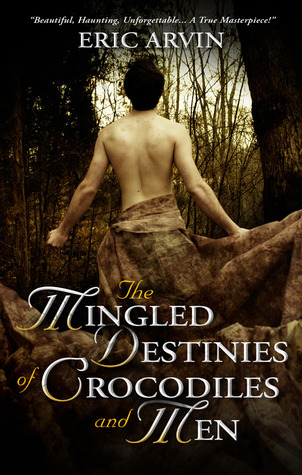 The Mingled Destinies of Crocodiles and Men is a story which captures and captivates its audience from the beginning. The atmospheric essence is intoxicating on its own. Yet the tale itself is an exercise in sheer adventure and enthralling delight. In a world filled with writers, few on today’s scene can be considered authors. Eric Arvin is among that special lot. Each successive story that flows from his boundless imagination is magic.